A perfect day deserves a perfect style comfort chino. Our newest addition to style and comfort is offered in multiple fits to satisfy any style. You are not only going to enjoy the fit of these chinos, but the attention to detail doesn&apos;t stop there. The pinstripe trims, soft pocketing and perfect fit, will have you reaching for these chinos to complete every outfit. 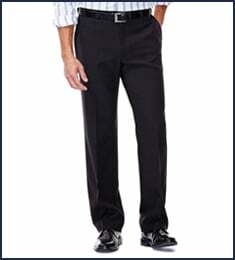 Big & Tall Coastal Comfort Chino is rated 4.3 out of 5 by 12. Rated 5 out of 5 by Slamin Sam from Great comfortable pants These are very comfortable pants. Size was perfect. Rated 2 out of 5 by cubunit5 from wrong size pants I purchased the exact same pants on line that I bought at the store but they were clearly a different size. They were marked properly but did not fit properly. 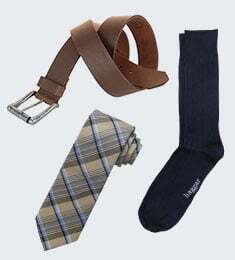 It is nice that Haggar has a free return policy, but it would have been much better if returning them wasn't necessary. 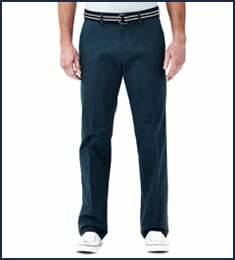 Rated 5 out of 5 by Bobby73 from Great features This pants are really comfortable, look great and are well made. Rated 5 out of 5 by imshaych from Awesome Pants! I love how these pants fit and the material feels amazing!! I love these pants so much I bought 5 pairs!! Rated 4 out of 5 by I am me from They look great. I bought them for my husband and they look great. He says they are comfortable. Rated 4 out of 5 by I am me from Look great. 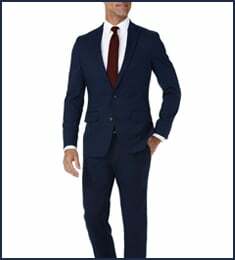 I purchased them for my husband and they look good on him. Rated 5 out of 5 by imshaych from Comfortable Pants! I love these pants!! they look great!! they feel great!! and the elastic waistband is AWESOME! !